If you bought a Google Home in the UK, you may be wondering why your new gadget feels less powerful than what you had expected. Sure, you can ask it questions and play music, but the services supported aren't as numerous as what you originally thought. Where's Logitech for example? And Todoist? And all those fancy names you keep reading about? Well, they should be under Services in the Assistant settings of your Google Home, but they're not. That's for one reason: the Actions on Google platform, which was opened to devs last December, is only available in US English. Add this to the list of inconsistencies with Assistant. Oh, oh, and the fact that Actions on Google are, for now, only accessible from Assistant on Home and not on phones, Pixels, or other devices. Not to beat a dead horse, but those distinctions are starting to get very annoying. 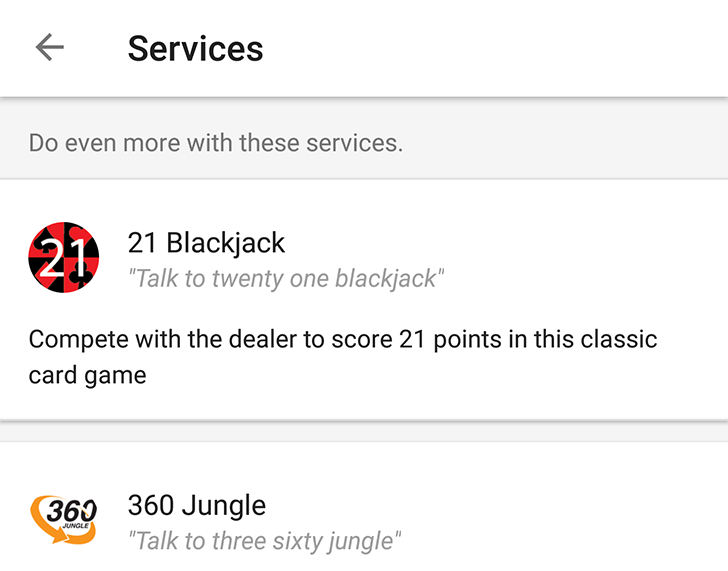 You shouldn't be thinking about what you can do, in which language, in which syntax (services require you to say "talk to X" first), and on which device when you want something from a smart "assistant." The slightly good news though is that Google is working on bringing more language support to the Actions on Google platform. When? Googler Wayne Piekarski says he has no formal release date, but it's happening. They'll let us know when they let us know. In other words, cross your fingers and hope for the best. It's nice though to see someone at Google acknowledging the missing features for our friends across the pond.